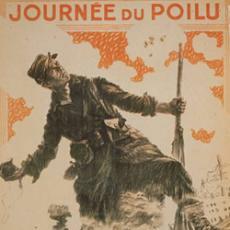 In nineteen fourteen, Europe exploded into the First World War. It was a war no nation really wanted. But no nation seemed able to stop it. The assassination of Austria's Archduke Franz Ferdinand in the city of Sarajevo was the spark that set off the explosion. This week in our series, Harry Monroe and Kay Gallant tell about the war and how it affected the United States under President Woodrow Wilson. HARRY MONROE: The Austrian Archduke was murdered by Serbian nationalists. They opposed Austrian control of their homeland. After the assassination, Austria declared war on Serbia. One of Serbia's allies was Russia. Russia agreed to help Serbia in any war against Austria. Austria had allies, too. The most important was Germany. Germany wanted Russia to stay out of the war. When Russia refused, Germany declared war on Russia. Then Germany declared war on Russia's close ally, France. 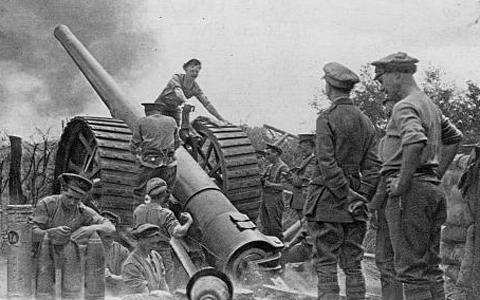 Britain entered the war a few days later when Germany violated the neutrality of Belgium. An abandoned British trench captured by the Germans. German soldiers are on horseback in the background. KAY GALLANT: One nation after another entered the conflict to protect its friends or to honor its treaties. Within a week, most of Europe was at war. On one side were the Central Powers: Germany and Austria-Hungary. On the other side were the Triple Entente Allies: France, Britain, and Russia. Many other nations took sides. Bulgaria and Turkey joined the Central Powers. Italy, Romania, Portugal, and Greece joined the Allies. HARRY MONROE: The United States hoped to stay out of the war. President Wilson immediately declared American neutrality. He said: "It is a war with which we have nothing to do, whose causes cannot touch us." Most Americans agreed with President Wilson. They did not want to get involved in the fighting. However, many found it difficult to remain neutral in their hearts. Some Americans had family roots in Germany. They supported the Central Powers. A greater number of Americans had family roots in Britain or France. They supported the Allies. Yet the official American policy was neutrality. The United States planned to continue to trade with both sides. KAY GALLANT: Germany and Austria expected a quick victory in the war. They were caught between two powerful enemies: Russia and France. But German military leaders were not worried. They had a battle plan they were sure would succeed. The German generals planned to strike quickly at France with most of the German army. They expected to defeat France in a short time and then turn to fight Russia. In this way, the German army would not have to fight both enemies at the same time. HARRY MONROE: At first, the plan worked. Two million German soldiers swept across Belgium and into France. They rushed forward toward Paris, hoping for a fast victory. But the German commanders made a mistake. They pushed their men too fast. When British and French forces struck back -- outside Paris -- the tired and worn German soldiers could not hold their positions. The battle was fierce and unbelievably bloody. In the end, the Germans were forced to withdraw. 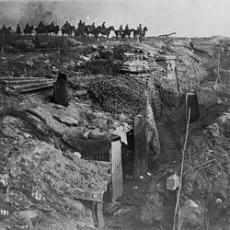 The German withdrawal gave the allies time to prepare strong defenses. There was no chance now for a quick German victory. Instead, it would be a long war, with Germany and Austria facing enemies on two sides. Britain and France were on the West. Russia was on the East. KAY GALLANT: The Allies took immediate steps to reduce Germany's trade with the rest of the world. The British navy began seizing war supplies found on neutral ships sailing toward German ports. It then expanded its efforts to block food exports to Germany. The blockade by Britain and the other allies was very successful. Germany faced possible starvation. Its navy was not strong enough to break the blockade with surface ships. Its only hope was to break the blockade with another naval weapon: submarines. 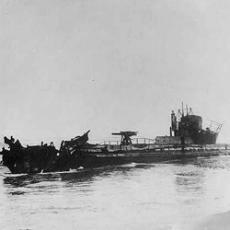 Germany announced that it would use its submarines to sink any ship that came near the coast of Britain. The threat included ships from neutral nations that tried to continue trading with the Allies. HARRY MONROE: The United States and other neutral nations immediately protested the German announcement. They said it was a clear violation of international law. When a German submarine sank a British ship in the Irish Sea, one of the victims was an American citizen. A few weeks later, an American oil ship was damaged during a sea battle between British navy ships and a German submarine. Then came the most serious incident of all. It involved a British passenger ship called the Lusitania. The Lusitania was sailing from New York City to Britain when it was attacked by a German submarine. The Lusitania sank in eighteen minutes. One thousand two hundred persons were killed. One hundred twenty-nine were Americans. KAY GALLANT: The sinking of the Lusitania shocked and horrified the American people. They called it mass murder. They turned against Germany. President Wilson warned that he might declare war on Germany, if Germany continued to sink civilian ships. Germany did not want war with the United States. It already faced a strong fight against the European Allies. It promised not to sink any more civilian ships without warning. And it offered regrets for the Lusitania incident. HARRY MONROE: President Wilson accepted Germany's apology. Like most Americans, he hoped to stay out of the bloody European struggle. And he also knew that the record of the Allies was not completely clean. For example, he was troubled by reports of mass hunger in Germany. He and other Americans felt the British food blockade was cruel. They also were shocked by the way British forces brutally crushed a rebellion in Ireland at the time. Most of all, the American people were sickened by reports of what was happening on the battlefields of Europe. The armies were using poison gas and other terrible weapons. Soldiers on both sides were dying by the millions. The war had become a bloodbath. KAY GALLANT: The United States had a presidential election in nineteen sixteen. 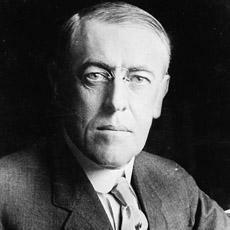 President Wilson won the nomination of the Democratic Party to seek re-election. Democrats around the country shouted their support with these words: "He kept us out of war!" Wilson himself did not like the words. He felt it raised false hopes. But people continued to say it, because they did not want war. HARRY MONROE: The Republican Party nominated Supreme Court Justice Charles Evans Hughes as its candidate for president. Hughes was a moderate Republican. He supported a number of social reforms. Like Wilson, Hughes promised to keep the United States neutral. However, one of his supporters was former President Theodore Roosevelt. And Roosevelt called for strong American policies that could lead to war. Roosevelt's words led many Americans to see Wilson as the candidate of peace....and Hughes as the candidate of war. KAY GALLANT: Voting in the presidential election was very close. At first, it seemed Hughes had won. He went to bed on election night believing he would be America's next president. But voting results later that night confirmed Wilson as the winner. The election was so close the Republicans did not accept defeat for two weeks. Woodrow Wilson had won another term. During that term, he would find it increasingly difficult to honor the words of the campaign. Finally, he would find it impossible. The United States entered World War One while Woodrow Wilson was president. BOB DOUGHTY: Our program was written by Frank Beardsley. The narrators were Harry Monroe and Kay Gallant.